Cosmetic Dentist Las Cruces NM | Smile makeovers with veneers, crowns, whitening & white fillings! We want you to feel good about your smile, and we can improve it with whitening, bonding, crowns, veneers, and more! Smile makeovers are much easier than you think and very affordable. Together with the preventive care we provide, the smile of your dreams can be achieved. Don't think your dental problems are beyond the scope of correction. You will be glad to know that we can alter the appearance of misshapen or gapped teeth, and even deeply discolored teeth, with porcelain veneers. 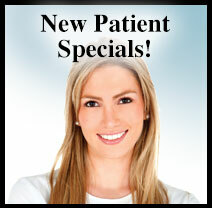 They can produce the straight and even smile you desire in just a matter of two dental visits. If you have chipped or cracked or worn-down teeth, veneers can be bonded to the tooth structure to hide the damage and give you a fresh look. Our veneers are very thin, yet durable dental ceramic. They are made to match the shade of your other teeth for a totally natural look. When a tooth is broken or worn away, a filling will not be the appropriate restoration. A crown is fabricated to save the tooth and return it to functionality. We use the best dental materials to make a durable, natural-looking crown. 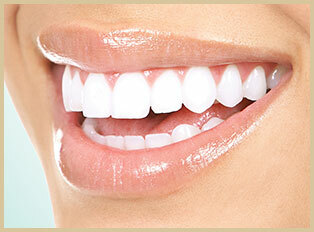 We also custom-make bridges of high-quality materials to replace teeth that have been lost. Some stains or discoloration can be difficult to remove, such as from taking the antibiotic tetracycline. Our doctors want every patient to have a dazzling smile, and we are proud to bring you a system that will remove even the most stubborn discoloring. KöR® Whitening goes beyond other professional methods to give the results you want. If you have been disappointed before, you will be smiling after treatment with the KöR Whitening method. Teeth can only become their whitest when you undergo one of a variety of professional-strength whitening methods. Our in-office whitening, called power whitening, has been used on television and is a fantastic way to present your best smile. Now you can have brilliantly white teeth, without stains or darkness, in just one visit. The results can last for years! We also make whitening trays at our in-house lab. With instructions and supplies that we provide, you continue the process at home. Within one day to two weeks, your teeth will be white and your smile attractive. If you are not ready for a permanent change to your smile, but are dissatisfied with your current smile, we have a solution for you. Snap-On Smile™ is an appliance that fits over your upper and lower teeth and gives you a temporary solution to the changes you want to see in your smile. There are no shots, drilling, or tooth removal. The appliance is easy to wear and can be removed or worn while eating. It gives you a natural look, and you will be impressed with the appearance of your new smile. 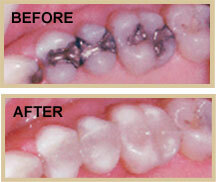 The silver-mercury amalgam has been used by dental practices for dozens of years. They are a reasonable restoration, but metal does not bond tightly to teeth. Eventually, the filling will loosen and allow decay to set in. Also, many people are unhappy with the appearance of a dark filling in light teeth. We use only composite resin fillings that bond very tightly to teeth. They are made to match the shade of the tooth they fill, and are unnoticeable when laughing or speaking. They actually add strength to the teeth while minimizing the chances of decay setting in. You may have problems with your teeth and gums and not be aware of how they are affecting your health and energy level. Chronic problems in the mouth can cause migraines, bodily aches and pains, bad breath, and an unattractive appearance. Tooth grinding (bruxism), TMJ disorder, malocclusion (improper bite), and periodontitis (gum disease) may be causing your discomfort and other health problems. Our doctors can return you to better health with a full-mouth assessment. With photos, X-rays, and impressions of your bite, they present a treatment plan to help relieve you of these problems and add to your quality of life. We also help in financial planning to make these improvements a reality. Schedule a complimentary consultation by calling (575) 522-1983, and discover how cosmetic solutions and teeth whitening can give you a brilliant new smile!